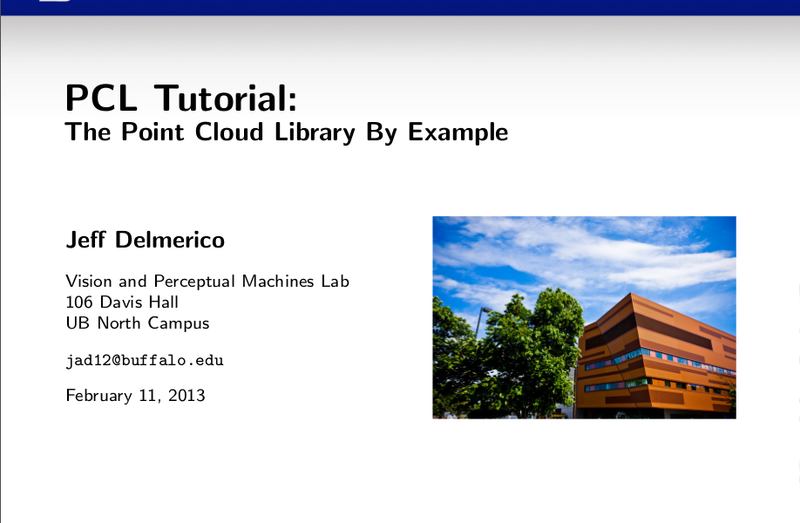 Last year I gave a guest lecture in a course on vision and robotics that was a brief tutorial on some of the basic functionality and usage for the Point Cloud Library. I collected and adapted some sample code from the PCL tutorials documentation as well as some PCL workshops that I attended a few years ago. I packaged everything into one repository so that there was a comprehensive introduction with a codebase that the students in the class could work from in playing around with in getting familiar with the functionality of the library. git clone https://jdelmerico@bitbucket.org/jdelmerico/pcl_tutorials.git I should emphasize that my contribution here is in collecting and streamlining the code samples into a library-level tutorial, but all of the programs were adapted from existing public tutorials on particular topics.